MVS Audio Visual is a nationwide Audio Visual integrator, providing design, installation and maintenance across the UK and Europe. Challenge: Center Parcs’ new village, Woburn Forest, was due to open just before the 2014 World Cup and needed a 12-metre projection solution in place in time for the big games. The sports hall, where the games would be shown, has considerable ambient light and the projector needed to be installed high up (around 10 metres high), so reliability and minimising maintenance were key. Solution: An Optoma EH7700 was installed with a ProScene WT2 (wide) lens in May 2014 in time for the opening of the new Village on 6 June and the World Cup games to start on 13 June. The EH7700 projector was chosen due to its outstanding brightness (7,500 lumens) and clear imagery created through the WUXGA resolution. Results: The new projector was cost-effective and exceeded Center Parcs’ expectations both in terms of cost and picture quality. Center Parcs commissioned MVS Audio Visual to install a large projection solution into the Sports Café restaurant at the brand new holiday village, Woburn Forest. Nestled in a 362 acre forest, the new Center Parcs village has an extensive range of indoor and outdoor sports and leisure activities as well as restaurants and a state-of-the-art Aqua Sana Spa. And with its Subtropical Swimming Paradise heated to 29.5°C, it’s summer all year round. Center Parcs operates five holiday Villages in the UK. Each is set in a forest environment, providing high quality holiday accommodation in 625 fully equipped Lodges, 75 hotel rooms and six luxurious Spa Suites. With Center Parcs’ Woburn Forest opening to short break guests just before the 2014 World Cup, the projection solution needed to be in place in time for the big games to be shown. Centre Parcs wanted a 12-metre diagonal image projected onto the wall of the Sports Café which would then be used for other major sporting events and televised events of interest. The sports hall has considerable ambient light, so the projector needed to be bright. It also needed to be installed high up (around 10 metres high), so reliability and minimising maintenance were key considerations. To gain access, MVS Audio Visual had to liaise with multiple contractors who were completing works on site. An Optoma EH7700 was installed with a ProScene WT2 (wide) lens in May 2014 in time for the opening of the new Village on 6 June and the World Cup games to start on 13 June. The EH7700 projector was chosen due to its outstanding brightness (7,500 lumens) and clear imagery created through the WUXGA resolution. The dust-sealed, filter-free design prevents dust and dirt from affecting the system and provides ultimate reliability in 24/7 operation ensuring optimal image quality with minimal maintenance. The projector also allows flexibility for Center Parcs to change the size of the image if required in the future. MVS installed the projector onto a pole mount from a girder on the roof and used existing cable infrastructure with video baluns either end to distribute the video from a communications room. 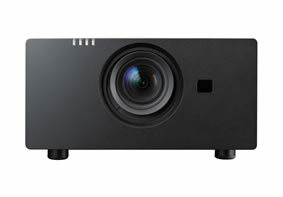 The new projector was cost-effective and exceeded Center Parcs’ expectations both in terms of cost and picture quality.